The Facebook ads platform may have dominated the social advertising space at the onset, but marketers’ paid social strategies are continually diversifying across social networks—and with good reason. LinkedIn, for example, is expanding it’s share with broader access in its audience network and the unique opportunity to target specifically around the workplace. More networks in play, means the need for more experimentation, optimization and analysis. However, generating cross-network insights can be time intensive, hard-to-digest and just plain tough. In fact it ranked as the second biggest challenge facing social marketers in our 2018 Index. There’s good news though! We are excited to announce that Sprout’s Cross-Network Paid Performance Report is here to help. By working campaign-level paid data from Facebook (including Messenger), Instagram, LinkedIn and Twitter as well as their associated audience networks into one report, you’ll get that time back and a few major benefits. For many, just getting an accurate account of Cross-Network spend in one place will be a big win. Now in Sprout you can understand spend, conversions, impressions, cost-per metrics and more in one report without any additional work–and then easily aggregate and sort every campaign from each network by KPI. Using the Cross-Network Report, you can quickly solve for your most valuable channel, generate a Cross-Network campaign overview or identify your best performing campaign to determine where your money will be most impactful. You might find, for example, that your CPV is twice as high for Facebook as LinkedIn. With this information in hand, your team can determine how to shift spend and have a true impact on ROI. Time-spent generating reports is an especially pronounced hurdle for agencies. If you have 12 different clients, all needing both monthly and campaign specific reporting, your team will likely spend a good bit of time generating reports. Instead of trying to cobble data together, using the Cross-Network report, you can easily accommodate all of the campaign data you need and quickly share it out with key stakeholders. In Sprout, this workflow is made simple: All you have to do is click the campaigns you want included, select your timeframe, and choose the client with whom you’d like to share. Or download to PDF for inclusion in your summary deck. Now, you have more time to focus on valuable strategic decisions that will help to grow your clientbase. As mentioned earlier, aggregating data is only half the battle. If the data isn’t accessible to you and digestible for your stakeholders, then what’s the point? 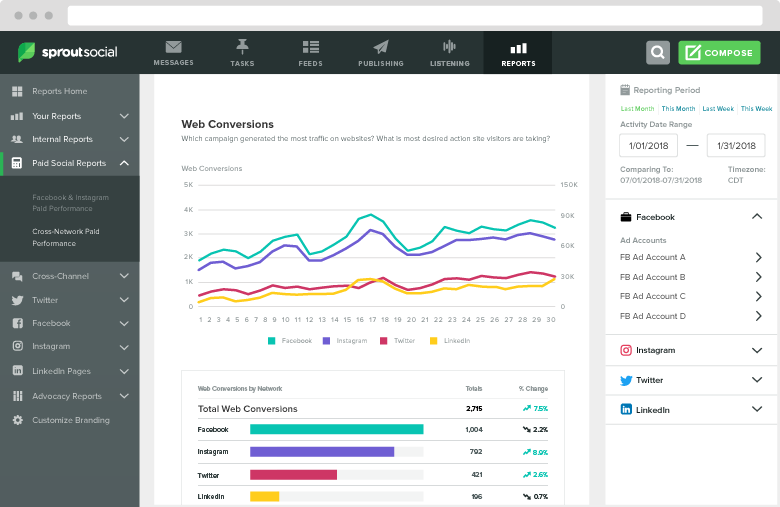 The Cross-Network Report is formatted with the same intuitive design you’ve likely come to expect from Sprout. Better yet, now that paid cross-network insights are under the same roof, as organic reporting and Listening, you can use the downloadable PDFs or screenshots to create an all-up campaign overview. Let’s say for example, we at Sprout wanted to define the value of our #sproutchats. We could take data from Listening or the Twitter Keyword report to measure earned conversation, use the Group Report to track our owned posts promoting the event, and rely on the new Cross-Network Paid Report to tell us how the paid side of things faired. Ultimately, the Cross-Network Paid Performance Report ensures gathering cross-network data is easier and getting a complete look at your paid strategy becomes daily routine. We have even bigger ambitions for our paid analysis tools moving into 2019 including deeper data to help you better optimize and new channels so stay tuned for more updates to come. And if you’re interested in checking out our paid tools, reach out for a demo here. Matt Tesmond: By day, Matt helps Sprout's customers get the most out of their Analytics, Listening and Paid solutions as a Product Marketer. By night, he loves to consume everything from TV to movies to music to Doughnuts. Mostly Doughnuts.